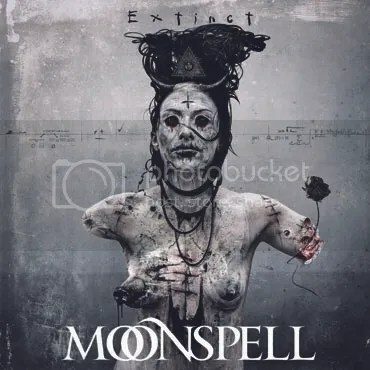 I’ve never liked labelling Moonspell as gothic metal as I’ve always felt they were much more than that. Until now. Well, actually, until “Omega White”, but since its counterpart “Alpha Noir” had that much-more in it, I still went for the vague “dark metal” at the time. Three years later, “Extinct” follows the path of “Omega White” and it leaves no room for vague descriptions – it’s gothic metal. Reading what I’ve just written and listening to the first single – a very pop-ish first single – “The Last Of Us” might give you a false impression of mainstream, so please read this until the end. Because “Extinct” is quite a masterpiece. Me being able to pinpoint what genre of music they’re playing doesn’t mean they’ve lost that little je ne sais quoi that makes them unique. There aren’t best songs here. Sure, everyone will have their favorites, but all tracks have been carefully crafted to a prime state. So despite the epic orchestral arrangements of “Extinct” and the fact that it’s the heaviest track, I believe the album was named after it due to the fatality ring such title bears and which echoes through others – “Breathe (Until We Are No More)”, “The Last Of Us”, “Funeral Bloom”, “A Dying Breed”, “The Future Is Dark”… See the pattern? And let me tell you that “La Baphomette” is macabre enough for your mind to associate it with the end of days. The short final track sung in French seems like it came straight from one of those horror-themed fairgrounds. “Medusalem” will bring you vivid memories of The Sisters Of Mercy but only for a short while. It soon starts making new memories of Moonspell alone, with the richness of its guitars and some Arabian sounds. In fact, the whole guitar work is to be praised. Turning to a more gothic direction gave them the chance of putting the roughness aside and producing elaborate but fluid pieces. A special highlight on the solo of the enthralling “The Future Is Dark”, where, as I like to say, the guitar weeps its strings out. In “Domina”, they cry with a bit more vigor. “Malignia” will seduce you with its dreamy nature, even if an ominous nightmare lurks around the chorus. This song comes right after “The Last Of Us”, which I’ve previously referred as pop-ish, so it’s quite the contrast. And mind that I’m not complaining about “The Last Of Us”, as its easy-going vibrancy is catchy and very pleasant. I was just concerned at the time of its release as a single that the whole album would be like that. After 10 albums – a double one included – I guess I should’ve known better, eh? This entry was posted on 24th February 2015 at 3:41 pm and is filed under CD, Metal with tags dark metal, Extinct, Gothic Metal, Moonspell, Napalm Records, new album. You can follow any responses to this entry through the RSS 2.0 feed. You can leave a response, or trackback from your own site.